Nigeria has filed charges against the pharmaceutical company Pfizer, accusing it of carrying out improper trials for an anti-meningitis drug. The government is seeking $7bn (£3.5bn) in damages for the families of children who allegedly died or suffered side-effects after being given Trovan. 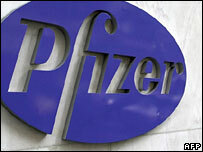 Kano state government has filed separate charges against Pfizer. The firm denies any wrongdoing, saying the trials were conducted according to Nigerian and international law. Pfizer - the world's largest pharmaceutical company - tested the experimental antibiotic Trovan in Kano during an outbreak of meningitis which had affected thousands in 1996. Some 200 children were tested. Pfizer say 11 of them died of meningitis, but Kano officials say about 50 died whilst others developed mental and physical deformities. The government says the deaths and deformities were caused by Trovan and that the children were injected with the drug without approval from Nigerian regulatory agencies. A Pfizer spokesman in New York, Bryant Haskins, reiterated the company's position that its trial of Trovan was conducted with the full knowledge of the Nigerian government and in a responsible way. "These allegations against Pfizer, which are not new, are highly inflammatory and not based on all the facts," he told Reuters news agency. He also said the trial had helped save lives. The company has previously said that "verbal consent" had been obtained from the parents of the children concerned and that the exercise was "sound from medical, scientific, regulatory and ethical standpoints". This is the first time Nigeria's federal government has filed charges against Pfizer but individual families have previously taken legal action. The separate case in Kano - in which the state is seeking $2.7bn in compensation - has been running for more than two years. On Monday, judges postponed that trial by a month, to allow the firm to appear before the Kano court. Trovan has been approved for use by adults, but not children, in the US. The BBC's Alex Last in Nigeria says the case has added to suspicion of western medicine and drug trials in northern Nigeria and that has had a damaging effect on attempts to get the whole population to accept polio immunisation. Kano was one of the Nigerian states which refused to take part in a World Health Organization vaccination programme, leading to a re-emergence of polio in Nigeria and neighbouring countries.